Generate installers for all supported platforms from one project file, on one machine. Build installers using either the GUI development environment or by directly editing a human-friendly XML file that can easily be integrated into your automated build process and version control system. Integrate with the underlying desktop environment and package management systems. Create start menu shortcuts on Windows systems, KDE/Gnome desktop shortcuts and register with the RPM system on Linux. Java-based multiplatform installation tools are notorious for producing slow-moving, bloated installers that do not integrate natively with the target operating system. BitRock InstallBuilder for Qt is easy to use and does not require bundling a Java runtime or a self-extraction step, which increases installer speed while decreasing size. Best of all, the generated installers have a truly native look and feel across all supported platforms. To get started, download an evaluation copy of InstallBuilder for Qt. What is the difference between BitRock InstallBuilder and InstallBuilder for Qt? Both versions of BitRock InstallBuilder offer the same robust functionality and easy to use interface. 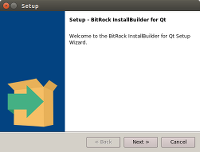 However, BitRock InstallBuilder for Qt was designed specifically for shipping software developed using the Qt development toolkit. Installers generated with this specialized version of InstallBuilder have a Qt-based frontend, allowing them to present the same familiar interface as the software they are installing. Projects created with regular InstallBuilder can be opened with InstallBuilder for Qt and vice-versa. InstallBuilder for Qt currently supports Linux, Windows and Mac OS X. However, the standard version of BitRock InstallBuilder supports several additional Unix platforms. Future releases of InstallBuilder for Qt will include support for Solaris, FreeBSD, HP-UX, AIX and IRIX. If you have any questions regarding the timeline for a specific target platform, please send an email to sales@bitrock.com.